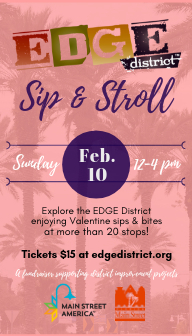 The popular EDGE District Sip & Stroll returns on Sunday, February 10, 2019 from 12-4 pm with a special Valentines flair. The Stroll is a fundraiser for the EDGE District Main Street, and will feature more than twenty stops at favorite EDGE District eateries, boutiques, cafes and pubs. Spanning from MLK to 16th Street and 1st Ave North to 1st Ave South, the EDGE District is a unique, art-filled landscape with a rich industrial heritage. It is vibrant with many eclectic and locally-owned businesses, over thirty large murals, and a majestic palm-lined central corridor. At the EDGE District Sip & Stroll, ticket holders can enjoy beverages including craft beer and cider, cocktails, wine, kombucha, kava, and gourmet coffee and tea. There are also nibbles at several stops, from gourmet cheese and charcuterie to hand-rolled ice cream. The February 10 event pays tribute to Valentine's Day with offerings like "Love's a Brewin'," "You Stoli My Heart," "Purple Passion," "Be Mine Wine," "Rosé All the Way," "Cupid's Cup," "Love Shack Snack" and more. Tickets are $15 until February 8 at www.edgedistrict.org, and $20 the day of the event. All proceeds support EDGE District community improvement projects. Public parking is available at 800 1st Ave. South, 1221 1st Ave. South, and 1250 1st Ave. North. Directions to the area are listed at www.edgedistrict.org. The downtown historic EDGE District is an award-winning Main Street America™ and Florida Main Street that plans, promotes, and advocates to sustain an eclectic, vibrant EDGE District community while preserving its unique character. EDGE District Sip & Strolls are organized by the EDGE District Main Street to offer guests a unique way to explore and experience this beautiful, historic, and vibrant area of downtown St. Petersburg.